Hallam Amos' inclusion in the senior trial means Afan Bagshaw will play in Wales Under-20's friendly against Scotland on Wednesday, 14 May. 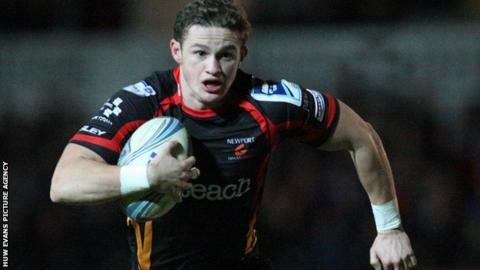 Newport Gwent Dragons full-back Amos is in the "Probables" squad for the Wales trial match on 30 May in Swansea. It means Rygbi Gogledd Cymru' Bagshaw is included as coach Byron Hayward prepares for the Junior World Cup. "It's great to be able to have a really physical run out against Scotland," said Hayward. The tournament takes place in New Zealand from 2 June to 20 June. Despite Hallam Amos leaving the squad to contend for a spot on the Wales tour South Africa, Hayward has confidence in his group of players, who face the Scots at Bridgend's Brewery Field. "Obviously it is a loss for us," said Hayward, a former Wales fly-half. "However, Hallam has a great chance to be picked for South Africa and it won't affect our squad in so much as Hallam wasn't part of our Six Nations squad. "Afon has been an integral part of the group all season and this gives him the chance to progress his game further."